I cannot remember when I first heard of, or learnt about, La Serenissima, but it would have been many years before my first visit. Of course this is the same with many places. We know the names Oklahoma, or Siberia, or Tokyo, without going there, but with Venice there is a particular fascination and a great deal of visual and imaginative evidence to hand. Some will remember the film “Don’t Look Now” for example, with its creepy images of dark canals and sottoportici. Others will have the wistful palette of Visconti in mind having seen “Death in Venice.” Others will have the speedboat glitz of James Bond in their stock of images. Television travel programs, images in magazines, posters in travel agents, garish ashtrays, and shiny plastic gondolas – all contribute to our knowledge of this unique city on the water. As a teenager I spent one summer as a guide in a Scottish castle and daily gazed at two enormous Canaletto paintings, marveling at the delicate pink of the Doge’s palace above the glittering water of the Lagoon. And then the remarkable thing was that when I did finally see that view in three dimensions with my own eyes, it was almost exactly as painted, and this is one if the continuing attractions of the place. It is not that old, compared with many another European city, but it is, in many ways, unchanged by history, or at least, less changed than most of the places we see. In 1892, Henry James wrote that “Venetian life, in the large old sense, has long since come to an end, and the essential present character of the most melancholy of cities resides simply in its being the most beautiful of tombs.” The sense of what he says is true. The population has changed, and certainly diminished, and there is no longer the bustle and business and pride that occupied the Venetian Republic before Wordsworth recorded its extinction. But then, to go back only a little in history, there was nothing there but reeds and rivulets, such as you see when your plane banks over the northern end of the lagoon. Attila the Hun, in A.D. 453 set the ball rolling by invading the neighborhood and causing people to seek refuge on the damp and muddy islets. 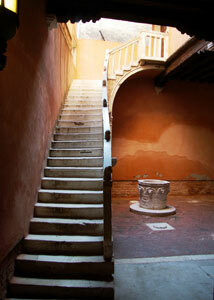 Life in Venice has wavered and flourished and receded, a little like the tides, over the centuries, but still goes on. I was recently amazed when, waiting for a certain assignation I had made in a quiet street in the Sestriere San Polo, the deserted Calle I stood in kept on becoming momentarily not deserted. People, with shopping bags and brief cases, kept appearing and disappearing, letting themselves into otherwise hidden doorways. It took me a while to realise that, in fact, people were going home. They had done whatever they did during the day, whether it was working in a shop or hotel or office, or managing the home for the numerous school children that also appear and disappear at certain times, and they were going back to their humble family residences to prepare the evening meal. After all, when you think about it, how else would all the food shops and market stalls survive? And there are many of them. Venice may be dying. But she sure ain’t dead yet! How long this will persist, however, is not easy to foretell. The phrase “Venice in peril” was responsible for television documentaries and news items many years ago. It no longer seems to be newsworthy, as if the lion has cried “wolf” too often. There is no doubt that she is sinking. In one hundred years Venice has ceded twenty-three centimeters to the sea; in the last seven years, she has lost four. In 1996 there were one hundred and one instances of “alta marea;” in the 1980s there were 12 instances when the tide rose 120cms. In the ’90s there were 14. In the first decade of the 21st century there were 20. 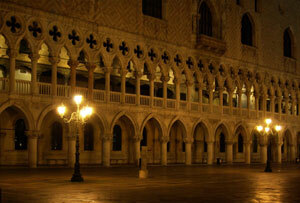 At 1.40am on Christmas Eve last year the waters in Venice had risen 144cms. It is definitely not receding! The phenomenon is complex and is generally attributed to low atmospheric pressure and sirocco winds from the south, but global warming and the melting of the ice caps seem to be behind the inexorable increase in occasions when the Vigili have to direct pedestrian traffic on the passerelle to avoid intasamenti where the tourists are photographing San Marco under water. As an extraordinary and highly successful example of human ingenuity and artistry, which, like all things, may not survive for ever, it is, worth first hand experience. 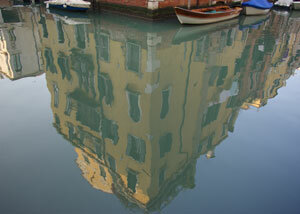 The worldwide trade in images of San Marco, or the Rialto, cannot substitute walking on the stones themselves. No amount of reading, whether it is Ruskin or the Rough Guide, can replace the exhilaration to be had in situ. A vaporetto trip down the Grand Canal must be one of the world’s finest bus rides, and it is one that bears repeating in different lights and seasons. In the depths of winter, at night, it has an unusual attraction, perhaps because of its un-photographable darkness. With snowflakes smudging your vision, the glimpses of illuminated ceilings, darkly glowing chandeliers, beveled mirrors that reflect smoky portraits, and the floodlit architecture of the facades, swirl past over the inky viscid waters. Around you stand silent, swathed Venetians, ahead of you looms the Rialto, festooned with a thousand Christmas lights; in the empty Fish Market stands a forlorn Christmas tree. It is a world apart from the warm brightness of summer nights, or the spooky levity of Carnevale, and far more difficult than the misty colors of the autumn, but it is a memorable part of the cycle, and one that cannot but entertain. 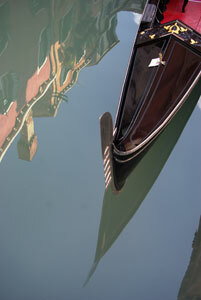 There are so many sights in Venice that repeated visits would never suffice. Art works abound and astound; architecture and nature work together to continually stimulate the visual imagination. There are guidebooks aplenty to help you choose, and your own taste will help you select, as you will not manage everything. Baedeker, in 1912, recommended five (very full) days for sightseeing. Who knows? If you are a retired film star who can stay indefinitely at the Daniele, then take your time. Breakfast in Florian’s, lunch at Quadri’s and dinner at Harry’s Bar. Maybe a picture or two in between. If you are a lesser mortal, may I suggest a wander to the Scuola di San Giorgio degli Schiavoni to see Vittore Carpaccio’s early sixteenth century cycle of paintings? And spend some time working out exactly how St George managed to spear the dragon so deftly on the left of his horse’s head. Brilliant stuff! Finally, when all else is seen to, in Venice, as everywhere, the weary visitor needs nourishment. Not surprisingly, there is no end of places to choose from, and many are regularly recommended by guidebooks. In the early sixties, James Morris declared he soon became tired of Venetian food, and, perhaps, if you had to reside there for a year to write a book, you also might tire of the diet, but these days a casual visitor will find the many osterie, bacari and trattorie, charming and stimulating. If you are willing to accept my recommendation, seek out Do Mori, near the Rialto, if you just want un’ombra (a drink) and some ciccheti (snacks). For something more substantial, head for Ca d’Oro alla Vedova, Cannaregio 3912, where copper pans and lanterns hang from the ceiling, and ceramic jugs and glassware nicely decorate the shelves. It’s a busy, popular place, but as authentic as you are likely to find. I took my daughters there. They loved it.